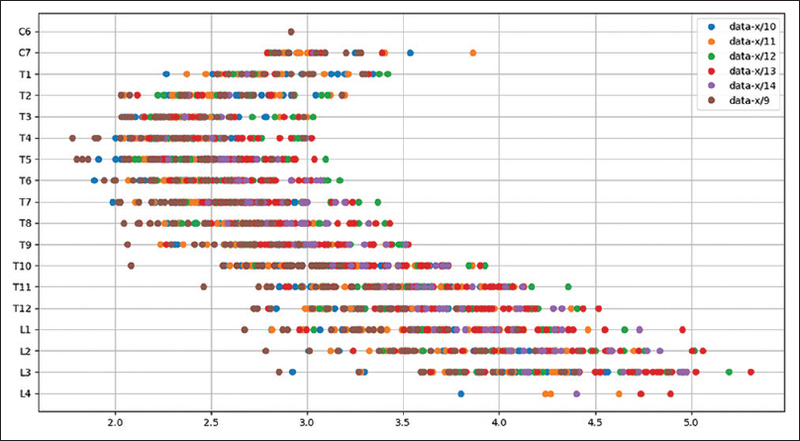 Study Design: We collected experimental data concerning vertebrae sizes and performed an investigation of these data for different patient ages by methods of mathematical statistics. Purpose: The standard dimensions of vertebrae and intervertebral discs are of major importance for obtaining a comprehensive understanding of spine diseases and their successful treatment. The purpose is to study these sizes for children at the age of 9–14 years. Overview of Literature: Unfortunately, this issue is poorly presented in the corresponding literature. There are no systematic results. Only particular cases are presented. Materials and Methods: Experimental is based on the: results of X-ray investigations of children spines. Theoretical background is given by methods of mathematical statistics. Results: Systematic description of vertebrae sizes for children of age 9–14 is given. This specific age interval is the most common period of initiation of various pathological deformations of human spine. Conclusions: The acquired data both reflect the process of spine growth and can serve for building correct mathematical models of a healthful or diseased spine. Pathological deformations of a human spine can be regarded as stable deviations of its shape from the normal state. 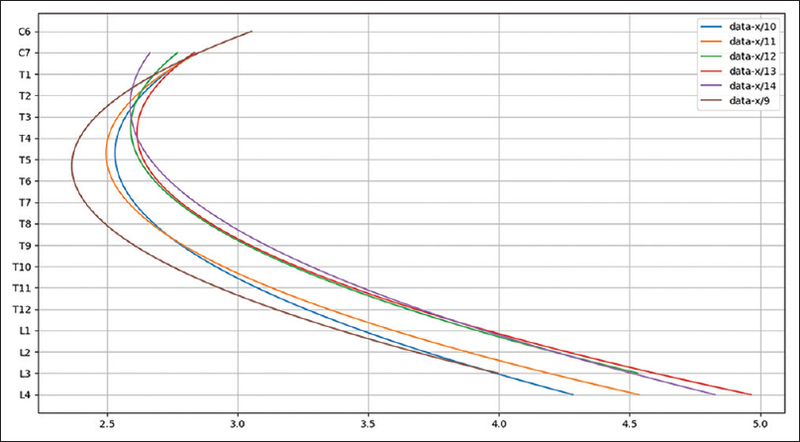 Like any disease, this deviation begins from minimal changes in the homeostasis. On the one hand, this preclinical stage is the most subtle to diagnose, but on the other hand, the most opportune for the treatment or prevention of the disease. This is also true for idiopathic scoliosis. Based on the broad information on the anatomic and functional properties of the human spine, repeatedly confirmed under various clinical studies,,,,,,, a mathematical modeling problem was formulated. 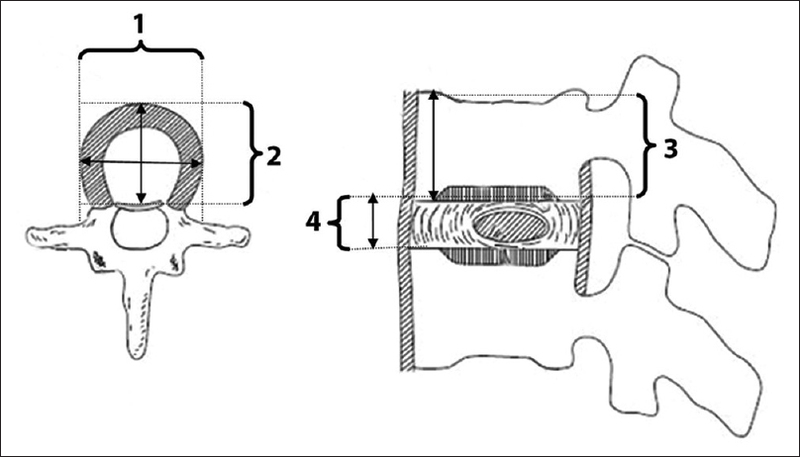 Attempts at solving this problem described,,, the process of formation of a three-dimensional deformation of the two-column human spine in the framework of theoretical mechanics. The modeling revealed a strict sequence of stages of deformation identical to the observed clinical picture. However, the models developed suffer from lack of concrete numerical values of the linear dimensions of the components of a spine, which prevents from applying them further to obtain the precise conditions of the transition from a normal to a scoliotic spine. To address this issue, we analyzed X-ray images of children's spines at different ages to reveal the real values of these parameters and their growth rates. It is hard to measure the linear dimensions of spine components directly due to its anatomic complexity. One of the available methods consists in examining X-ray images of the spine of patients of the Center for Rehabilitation for Children's Orthopedic Diseases “Ogonek” (Saint Petersburg). Two groups of patients were considered: one with spinal compression fracture and the other with flat back posture and with idiopathic lordoscoliosis of the first degree with deformation angle 5°–7°. Compressed vertebrae were ignored in the measurements. Furthermore, the low deformation magnitude in the second group when measured in the axial projection does not affect the observed linear dimensions of the vertebrae. A total of 497 X-ray images were used. 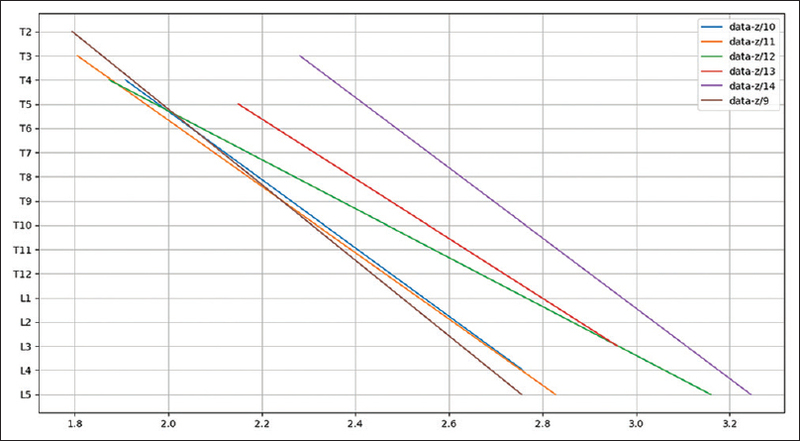 The detailed information on the numbers of images is presented in [Table 1]. 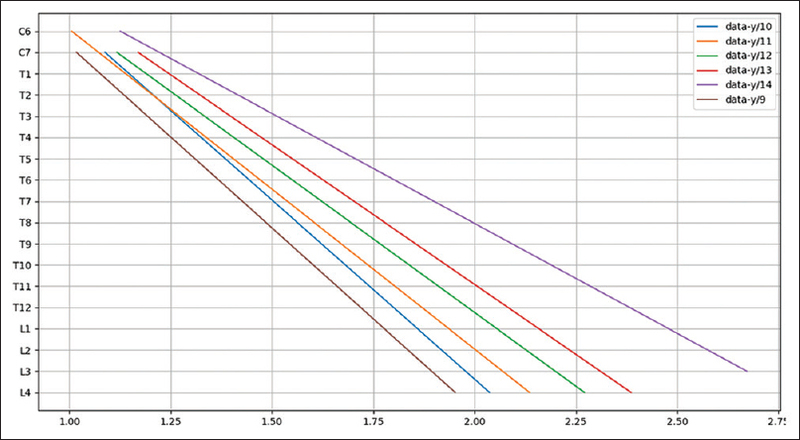 These parameters are depicted on [Figure 1]. 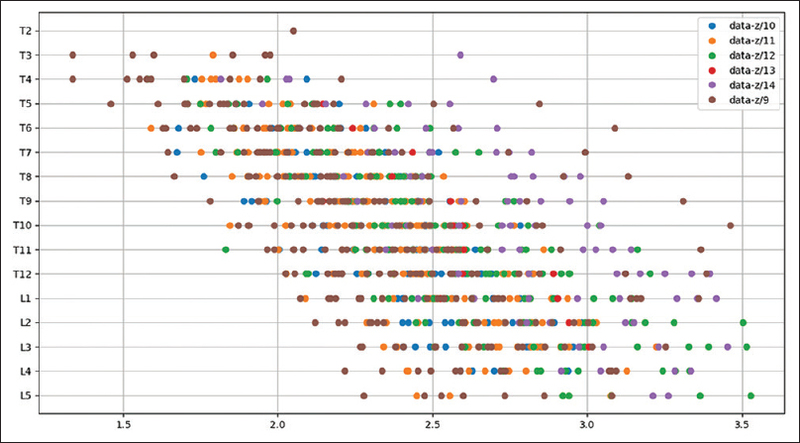 The obtained data arrays are plotted in [Figure 2], [Figure 3], [Figure 4], [Figure 5]. The mean values of linear dimensions of vertebrae for different ages were obtained through the method of polynomial regression. 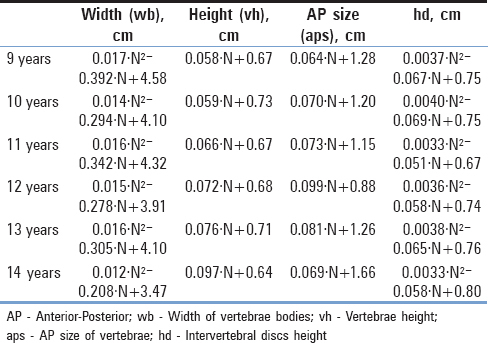 As a result, we obtained the averaged form of a linear dependency of vertebrae height and anterior–posterior size and an averaged quadratic dependency of vertebrae width and intervertebral discs height from the vertebra index. The vertebrae indices increase from top to bottom of the spine, vertebra Th1 having index #6, while vertebra L5 having index #23. 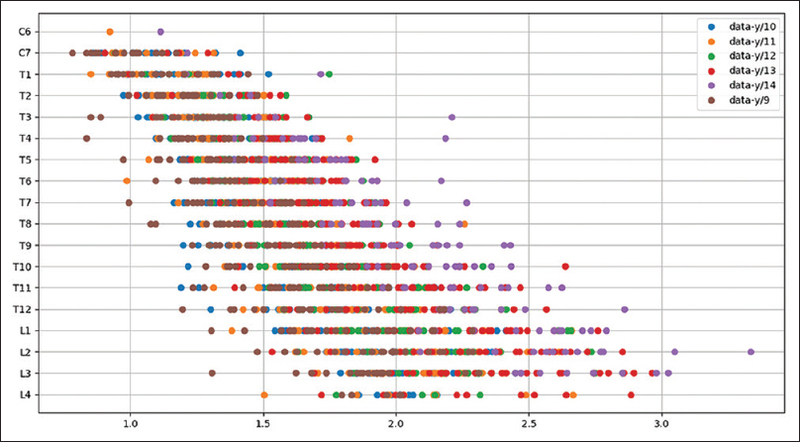 The numerical formulas of these dependencies are presented in [Table 2] (“N” is the vertebra index). 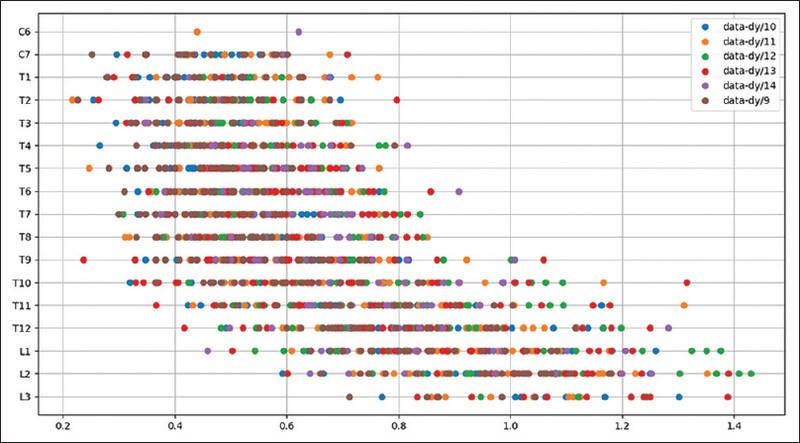 These dependencies are plotted graphically in [Figure 6], [Figure 7], [Figure 8], [Figure 9]. This work revealed simple yet informative approximations of the values of linear sizes of the components of the spine for children in the first half of puberty. These values can be used as a reference for building dynamic mathematical models of a normal spine, as well as models of its pathological deformations. The work was partly supported by the grant 08-08 of the Government of the Russian Federation. Bagnall K. How can we achieve success in understanding the aetiology of AIS? Stud Health Technol Inform 2008;135:61-74. Bagnall KM. Using a synthesis of the research literature related to the aetiology of adolescent idiopathic scoliosis to provide ideas on future directions for success. Scoliosis 2008;3:5. Duval-Beaupere G, Dubousset J, Queneau P, Grossiord A. For a unique theory of scoliosis evolution. Presse Med 1970;78:1141-6. Dudin MG, Pinchuk DY. Idiopathic Scoliosis: Diagnosis, Pathogenesis. St. Petersburg: Chelovek; 2009. Dudin MG, Pinchuk DY. Idiopathic Scoliosis: Neurophysiology, Neurochemistry. St. Petersburg: Chelovek; 2013. Dudin MG. Idiopathic Scoliosis: Prevention, Conservative Treatment. St. Petersburg: Chelovek; 2017. Kapandzi AI. Spine: Physiology of the Joints. Moscow: Eksmo; 2009. Roth M. Idiopathic scoliosis caused by a short spinal cord. Acta Radiol Diagn (Stockh) 1968;7:257-71. Dudin MG, Sinitskii YF. On the mechanism of torsion changes in scoliosis. J Orthop Traumatol Prosthet 1981;2:33-6. Dudin M, Olnev M. The three-axes model of vertebral column deformation. In: Stokes IA, editor. Research into Spinal Deformities. Vol. 2. University of Vermont, Burlington, VT, USA: IOS Press: Technology and Informatics; 1999. p. 69-72. Dudin MG, Baloshin YU, Bober SV, Pomortsev IY. Mathematical modeling of three-plane deformation of the human spine. Russ J Biomech 2016;20:272-82. Lisitsa N, Popov I, Baloshin Y, Dudin M, Bober S. Variational model of scoliosis. Theoretical and Applied Mechanics. 2018;45:167-75. DOI 10.2298/TAM170818012P. Lewis-Beck MS. 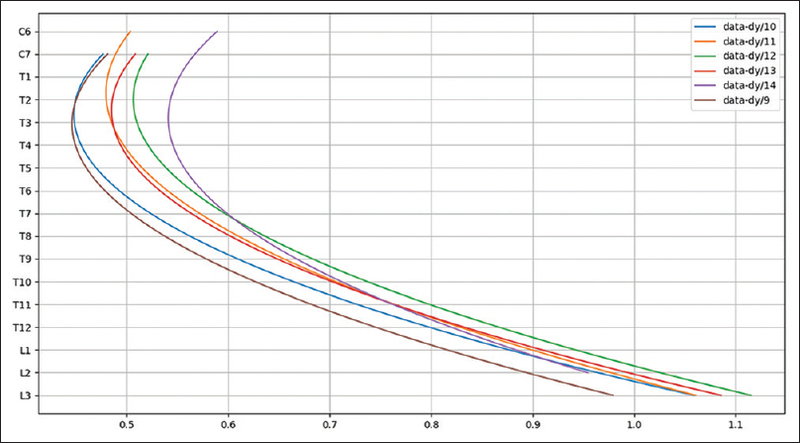 Applied Regression: An Introduction. New York: SAGE Publications; 1980.